Stephen B. MacInnis lives and works in Charlottetown, Prince Edward Island, Canada, where he was born and raised. A painter, for the past several years he has been working on a long-term project entitled Long Series, a series of over 1,300, 12×12 inch mixed media paintings. It is his plan to complete 10,000 paintings in this series. Stephen works prolifically in an almost mass-production manner, with several hundred Long Series pieces in progress at any time. 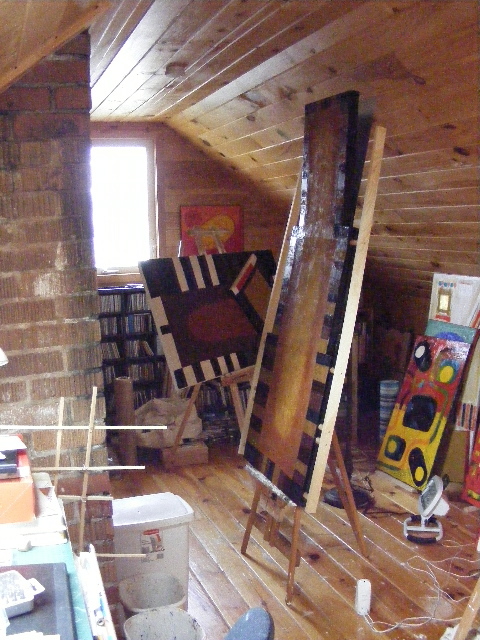 From pieces with early simple marks, to pieces heavily worked and nearing completion, the work piles up. Each day, Stephen selects one or two and finishes them. The progress of the Long Series has been recorded online in a studio diary called Painter’s Progress in which he records the daily activities and interests of a working artist. Just came by happenstance..and glad I did…I want to respond to your exhibition that I saw the night of “The Outsiders play” (worked well together)wanted to tell you that I do care that you are painting, but don’t care what you paint. Standing in front of one of your paintings…it was red…and deep, lotsa paint, with broad stoke movement…and I felt how totally frightening it must have been for you to start painting like this and i thought “Stephen has given birth to two children this past year” ! Great site..not half thru it yet so will come back. Will also share it with CJ. Relucktantly left my Jenn Grant cd with her…and now she figures her and Jenn are on a first name basis since they spend so much time together!!!! Hi ,Stephen. You are a great artist. I enjoy looking at your paintings. I once had a dream of taking up Fine Arts in college but I ended up in the medical field. But as they say once your an artist, you’ll always be an artist. Stunning work. Thank you very much. Very kind of you to say. So glad you visited my site so I could find yours! What a visual feast, Stephen! Thanks Catherine Great to find your blog. Love the photo of the spider! Thank you, very nice to come across your blog too. I’ll keep coming back. Your welcome. It’s always great to find a new blog. I like what your doing, and thanks for checking out mine. Hi there, you have a great blog and I love your work! Thanks so much for stopping by my blog, otherwise I wouldn’t have found another great Canadian painter. I like your work very much.and your philosophy. Thank you for your comments. Your work is beautiful. Thank you for visiting my blog! I am honored that you like my work – Dripping Faith…I’m now following your blog. When you press the like button it takes me to your gravitar but it doesn’t have any reference to your blog so I could never respond. I didn’t connect you in your hat with this blog. Now I have to go back and put the hat with this blog! It could be my ignorance with wordpress or you may need to somehow have your blog website under your gravitar picture. as I say it could just be me. Thanks, I’ll have to look into that. I thought I had my info there. I really like your blog and what you’re doing. It’s mutual _ thanks . I’m following you now so I won’t lose you. I twittered you & linked in your page. it looks great! Thank you Richard I appreciate it. Thank you. I’ll look forward to seeing more from your blog. Hello Stephen! Thank you for “liking” the work on my blog. It’s so good to see your work here – I love the patterns in your paintings. Also, growing up in Maine I was able to visit Nova Scotia and loved it. I never made it to Prince Edward Island, sadly. I lived on an island off the coast of Maine for one summer a while back and currently I am re-doing some of the work I did there. I hope you’ll come by my blog again to check out the “island” paintings when I post them. I look forward to seeing more of your work too. Wes. it’s great to see your artwork on here. I love the bright colors and compositions. And I find the theme Long Series very interesting making the same size pieces over a longer stretch of time. Thank you for sharing your wonderful paintings and giving a glimpse into your studio and the art books that inspire you. I’m also drawn to abstract art, but sometimes it feels to me like swimming without knowing if there is a ground underneath at all. Hi Brigitte. Thanks for your kind comments, and visiting my blog. Thanks for liking my posts, I appreciate it, I’ll have a look around your blog! Thanks Emily I appreciate your thinking of me. I’ve been meaning to put a award post together, and today I saw Cath Rennie’s and she’s given me some inspiration about how to do it. Hi – I started with you a long time ago and just am catching up (lost you somewhere along the way) Your readership has sure grown… Congratulations. Do you have plans for a show of the completed Long Series. what an exhibit that would be! Hi Carla and thank you! Hi StephenI I absolutely LOVE this series. Such beautiful work. You’ve inspired me. I have 7 small pieces on paper. Each 7.5″ x 7.5″ that I made recently. They felt lonely and unfinished. Then I happened on your series through Kimberly Rowe and I know what I want to do with them! I want to do my own long series. So much discipline it must take and I don’t know if I can do as an amazing job as you have but, I’m going to try. Thanks for the inspiration. I’m going to purchase a piece from you to put on my wall and remind me of my intentions. Wow thanks Nancy. I really appreciate your comments and good luck with your work.